The value of a Michigan education goes far beyond the classroom walls. Students who engage with the campus community outside of the classroom will not only have an impressive resume to accompany their diploma but also will have acquired a greater perspective on the world around us. Maizepages is an online database of student organizations on campus. Students can search the database by subject or topic to find student groups and the group’s contact information. By reaching out to the group directly, students can find out about any upcoming meetings. Winterfest is a student organization recruitment fair that will be held on January 22 & 23 in the Michigan Union. This is an opportunity for students to visit informational tables about various student organizations to learn more about getting involved. Intramural sports are a great way to meet people. While many students sign up as a whole team, individual sign-ups (also known as “Free Agents”) are also welcome. If space permits, Free Agents are assigned to teams looking for players. Intramural sports offer both exercise and socializing at the same time! Engaging in community service can be a rewarding addition to any college career. The Connect to Community online portal provides students with information about getting connected to volunteer opportunities in the area and around the world! U-M has a rich tradition of the arts on campus. The pleasure of a concert, play, dance performance, or exhibition can provide not only a welcome break from intense academic work but can also help students to make connections between in-class academic work and outside of class activities. 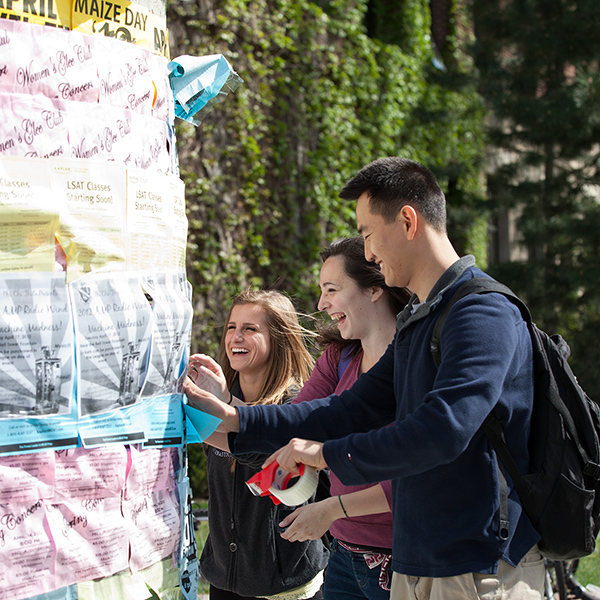 Students can learn more about ways to connect to the campus arts scene through Arts at Michigan. Campus jobs provide students with the opportunity to make money and make friends! From the dining hall to the recreation buildings, to tour guides, and summer orientation leaders, having a campus job is an excellent way to meet other students on campus. A full listing of student jobs can be found through the Student Employment Office. It’s never too late to get connected on campus. If your student is having trouble finding their niche, be sure to send them to the Center for Campus Involvement for more ways to find their place!